Tanjung Rhu (meaning cape of pines) is the north western coastal area of Langkawi and Teluk Yu (meaning Shark Bay) is an area along the northern coast line. This entire stretch only reminds me of beaches, beaches and beaches ... lovely white soft and finely powdered sands overlooking the turquoise blue water and several tiny islands, an ideal for swimming. And all this in a serene secluded ambience. There are very few hotels at this end to spoil the beauty and few tourists who take the trouble driving all the way to this far end of the island. 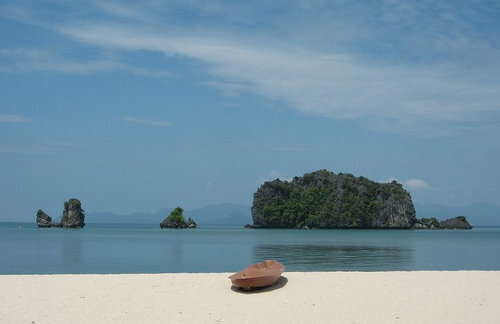 So once you are there in a place like Tanjung Rhu, much part the beaches are exclusively yours. There are small local shops along the coastal road that sells local dresses, souvenir & gift items. There is also a restaurant with a few open hut structures right in front of the beach. They serve Malay food. But after a long swim under the dazzling sun, the fresh coconut water here is my favorite. There is always a nice cool breeze flowing in this area and you don't really feel the heat that much even in peak summer. But the sand gets really hot though. But Teluk Yu area is devoid of any hotels. Other than a local market at the Black Sand Beach area and the craft complex, there aren't much shopping opportunities at this end. There is a restaurant offering snacks and meals located at the western end of Shark Bay Beach. Top Restaurants in Tanjung Rhu & Teluk Yu Areas: Few mid-scale roadside restaurants other than the ones in the resorts.